farming and construction vehicles and equipment. 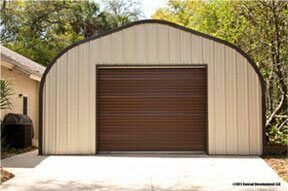 Metal Building Kings steel arch truck garages and storage buildings are perfect for semi tractor trailer storage and parking as well as all construction and farming equipment. 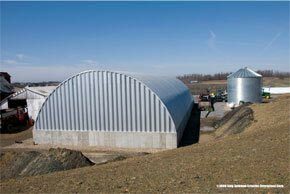 The low cost of a prefabricated steel building and it superior durability and building certification for severe weather - to withstand hurricanes and heavy snow storms and snow loads is ideal for truck storage. 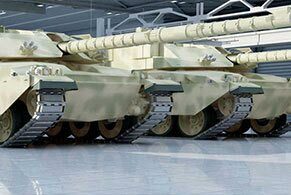 You can design your metal garage kit as long as you need to house large trucking fleet terminals and as wide as you need for side by side parking. 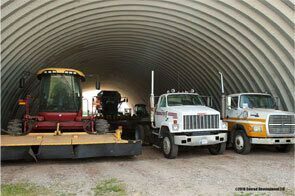 Metal arch truck buildings go as high as 24 feet to allow you free clearance to work on the exhaust, scoops or trailers or install overhead vehicle wash bays. The height, free of rafters, allows easy towing and installation of hydraulic lifts to work on large trucks. 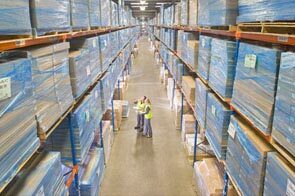 The unlimited length and over 100 feet in width makes it easy to unload and reload shipments and hauls inside the security of the building. 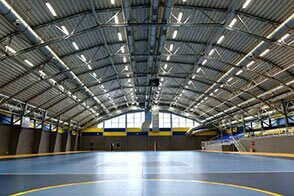 Install ventilation systems and overhead skylights to bring in natural light and lower energy costs. 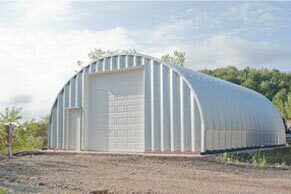 Steel arch buildings are perfect for semi tractor trailers and construction trucks and machinery because they are secure and prevent the issues associated with wood framed buildings. 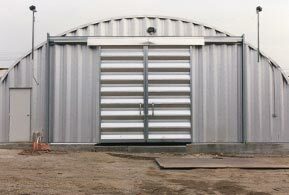 Choose heavy gauge steel and customize your end walls with electric roll up doors and secure locking mechanisms. 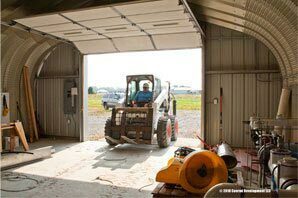 Install custom lighting and adapt your truck garage storage building to fit your mechanical, repair and maintenance needs. 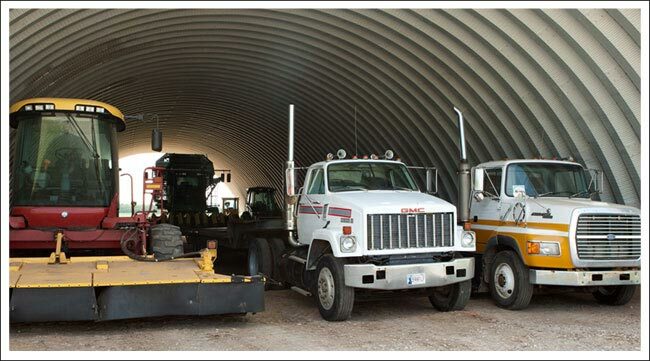 In addition, the completely prefabricated metal garage eliminates fire hazards that could threaten your fleet. 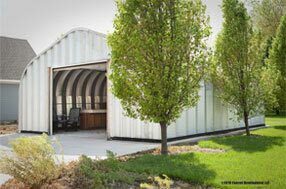 With no beams or posts or trusses in your steel truck garage you have a 100% usable clear span area inside and clear of all bird nests and rodents that would affect the exterior or operation of your vehicles. 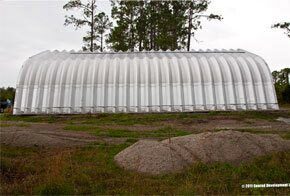 You can even add on to your trucking space by extending the length as you need more room in the future. With an easy to assemble design, all you need to do it bolt the prefab metal arches, angles and end walls together using the included hardware and our step by step instruction manual. Pour a nice concrete foundation with drainage before you get started to have a clean environment for maintenance and wash downs. Our trained customer service representatives are always here to assist you. We will help you price out your building based on your county’s building codes. If you need a building plan to obtain a permit we can assist you! Your Metal Building King arch building is coated with AZ55 Galvalume® - which is comprised of aluminum, silicone and zinc, a state of the art coating to help prevent rust and comes with an industry best 40 year rust-through perforation warranty and a 40 year warranty against peeling paint, flaking an loss of adhesion. 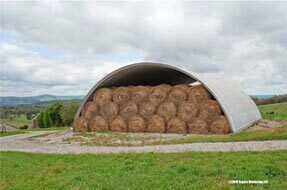 The engineering and design withstands severe wind and snow loads and is virtually maintenance free.